In February 2007, a US Senator by the name of Barack Obama had the audacity to hope that the U.S. Government would change it's way of doing business. President Obama and his grassroots volunteers set a new standard and changed campaign elections in America forever. After listening to his speech, we did a little research about Barack and Michelle Obama. We wanted to know more about who they were and what life experiences they had. Having two daughters also, It was refreshing to find a candidate that could relate to our middle class lifestyle. 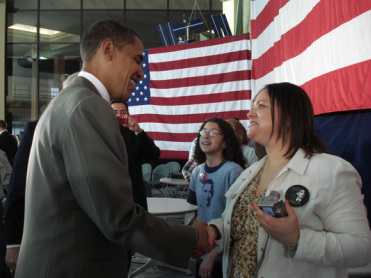 I asked my husband to put me in touch with the Obama for America Campaign, and shortly thereafter I was asked to help kickoff his first west coast campaign rally at the Clark County Government Center along with sixteen other volunteers. Little did I know that on February 17th, 2007 my life would change forever. From our very first campaign meetings in homes and local coffee shops to the grand opening of dozens of campaign offices throughout Nevada, the experience was electrifying and the excitement was contagious. The energy was so addicting it seemed overnight that we were busting out from the seams, volunteers lifting each other up with regular potlucks, snacks, and desserts. We were united by a universal feeling that what we were doing was right and worthwhile and as a result developed life long friendships that often felt like family. It was a highlight and an honor to host President Obama at our home for over 200 Precinct Captains in the summer of 2007, for their tireless efforts to elect Barack Obama our Democratic Nominee for President of the United States, and can't think of a better 50th birthday celebration than to have the privilege of representing Nevada Delegates in Denver at the Democratic National Convention as an Obama Delegate. Signing my name to the Presidential Nomination Ballot in 2008 in support of US Senator Barack Obama is a cherished memory. Throughout this whirlwind experience, I felt the passion for change ignite in me and a conviction that each of us CAN be that agent for change that President Obama spoke of in his speech. Yes, we can. Years later and two presidential inaugurations later, the community work hasn't gotten any easier. In fact, as we peel back the layers of public policy that systemically disenfranchise people, we must not faint in our effort. The journey was never promised to be easy... Look at our history. Yet, that history also demonstrates the ability to DO better, and that's what keeps me in the fight for equality, justice, and access to opportunity. We must stay the course and continue to pass the torch to the next generations until one day we reach the promise land spoken of by Dr. M.L.King Jr. In the spirit of President Barack H. Obama, the greatest gift we can give our children is the "audacity to hope." I hope you leave informed, inspired, and empowered. Recipient, 2009 National Black Justice Coalition "We Care Award"